Posted on April 12, 2014 by Warin	in Native American, stereotype. I would have loved to been there to hear this conversation. At a time when the debate over using offensive Native American caricatures is raging around teams like the Washington Redskins and Cleveland Indians, we don’t often hear from Native Americans themselves on these issues in a national context. Which brings me to the image above. I saw this photo a few weeks back on Twitter and found it interesting for a number of reasons. 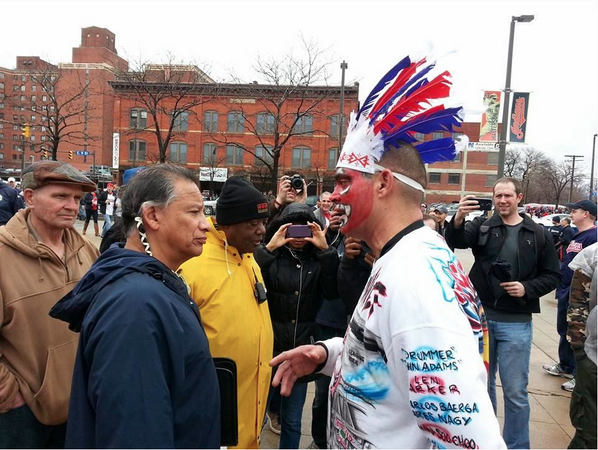 For starters, hear is this white guy clearly with red coloring on his face and a shirt that says, ‘Fear the Chief.’ He is confronted by a Native American man who looks none to happy with the man’s caricature of his people. And lastly, this being 2014, there is a crowd of people in the background capturing this on their cell phones. Thoughts?